Ten members of the Networks team have signed themselves up for Rough Runner 2018 , in a bid to raise money for two great charities – Mount Vernon Cancer Research Centre and St Luke’s Hospice. The 5k event, combines distance running and obstacles inspired by TV game shows like Gladiators, Total Wipeout and Ninja Warrior. These charities are very close to a number of the runners’ hearts, as they have experienced first-hand how much hard work, time and dedication the staff at both St Luke’s and Mount Vernon put into their work on a daily basis. The Mount Vernon Cancer Research Centre balances the inclusion of the latest technology with the employment of highly trained staff in order to provide a highly specialised service. They have a huge task to complete, with over 5000 new patients registering with them each year. St Luke’s Hospice was founded in 1983 and provides specialist palliative care for those with non-curative illnesses including cancer and heart failure. Their aim is to maintain and enhance the quality of life for patients, caring for each of them as a whole person, offering them the right to be treated with dignity, sensitivity, compassion and understanding. One thing both organisations have in common is a strong focus on providing a network of support, not only for their patients but also for family and friends during extremely difficult times. “My sister passed away on 24th December 2017, she was diagnosed with Bowel cancer 4 years ago and had been going to St Luke’s Hospice in Basildon. They looked after her so well especially when she was passing, their hospitality was amazing, and I can’t thank them enough for allowing us to be with my sister 24/7. 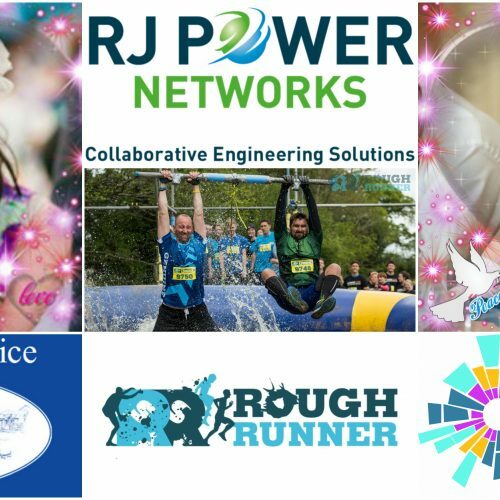 With this in mind, RJ Power Networks want to raise as much money for both charities as possible and have set an ambitious target to raise £5,000.00 in the next 6 months. The money raised would be split equally between the two charities, so that all of their positive work can continue. There is no minimum or maximum donation amount and any support is gratefully received. The team are currently busy focusing on getting healthy and commencing a training routine to prepare them for the challenge. It will take a lot of team work to get around the course as the obstacles are quite challenging. Thank you in advance for your support, we will have people with GoPros running so expect some spectacular photos of the team shortly after the event in September.